Frumenty is kind of a wheat pottage made from boiled wheat with the addition of eggs, broth or milk. My version substitutes wheat for barley, so this is a barley frumenty. Lately I have been coking medieval dishes and I had wanted to try to make frumenty for quite some time. As we were having a beef steak, a good beer and kale and orange salad, this seemed fitting. I based my version on the one you find on medievalcookery.com. Traditionally frumenty is made with wheat, but we didn’t have any. I do like barley better that wheat, so I decided to make a frumenty with pearl barley instead. That of course changed things a bit. I do however find it quite plausible that people would have made it like this as well. The original recipe called for safran, which I left out on the bases that it wouldn’t have been added in the poor man’s version and safran was only really just colouring. I also had to reheat the porridge to thicken it, which the original recipe doesn’t do. 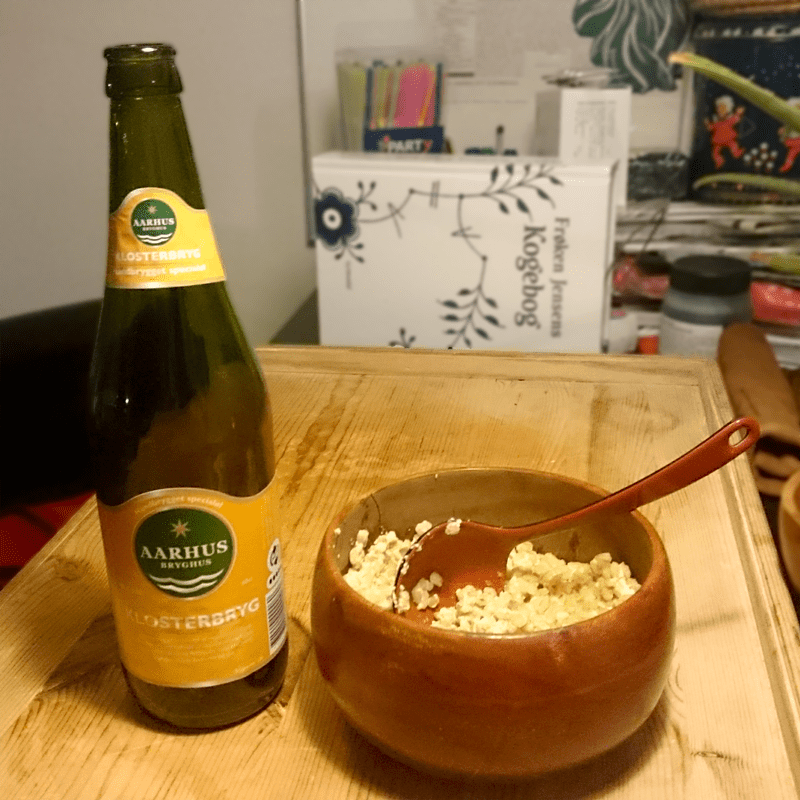 It turned out to be more than just eatable – the barley flavour came though nicely and I had left the grains al dente as I normally do with perle barley. On the plate it sat up nicely. My boyfriend did say that he would rather have had potato but that he isn’t much for porridge in the first place. The portion was quite large – we ate little less than half the portion – it is properly for four people. I had brought big bottle of beer for dinner because it seemed like the fitting thing to have with some medieval food and a steak. It is a cluster brew from Aarhus and I have to say it was really good. It’s called “Klosterbryg” from Aarhus Bryghus. If you see it somewhere you should give it a taste. A barley porridge made with eggs and milk as a side dish with meat. Based on a number of 1300’s and 1400’s recipes. Boil the water and add the barley once it is boiling in a pot. Add a lid and let it boil until al dente - that's about 15-20 min. While it cooks you separate the egg and add the yokes to the milk along with the salt. Mix it together. Add the egg-mix into the barley and simmer it until it thickens.